For some time now, I’ve been intrigued by the movement towards more “augmented reality” apps are allowing people to layer information on top of the view of physical objects. I suppose this idea has been given a great big push forward with the emergence of the Google Glass project. But, how to experiment with it? Erin Klein, a friend in several teaching networks, shared a post this weekend at her blog that helped show one way forward. She describes in great detail how she is beginning to use an Augmented Reality app called Aurasma, which is a free and allows you to set up a virtual layer of information on top of images. (The layer is called the “aura” by the app.) What’s nice is that it is not overly complicated. You essentially choose the layer (either one that comes with the app or you make your own), then choose what it is that you want to layer information over, take a photograph of it, and then whenever you look at that image through the mobile device screen, the layered information magically becomes visible. While there is a bank of “auras” built into the app, Erin assures me that you can create your own media (video, etc.) and use that as the layer, too. You can even publish the augmented reality layer at the Aurasma website, and share it with others. I experimented first with a little dancing ninja popping up on a flower pattern on one of our rugs, and then brought my 8 year old in to check it out. Yeah. He was jazzed about it. He kept putting his hands down to the ground, wondering where the ninja was. But, the thing is, you would need to have my rug in your viewer in order to see what I am even talking about. No offense, but I am not inviting the world into our sun room to watch the ninja in action. So, I looked around my bookshelf for a book that I thought others might have access to. 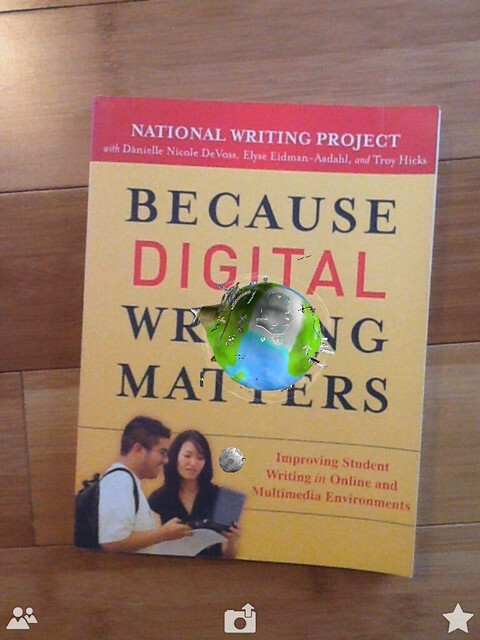 Since so many of my friends are in the National Writing Project, I pulled out Because Digital Writing Matters, and layered a floating Earth on top of it. Tap http://goo.gl/vK2NT to view my Aura. If you don’t have the book itself, you can point your mobile device at this image of the book and click on the link above (This is where you will need to juggle your mobile device with your computer, I suspect. Oh, and you have to have the Aurasma app downloaded, too. I should have mentioned that. Center the image with the app open, and the layer should start by itself). It should still work by using the embedded image of the book, although you have be sure to carefully situate the view in the screen. So, what’s the point? There’s the cool factor, for sure, but is there more to it than that? Erin does a much better job explaining how you might begin to conceive using Augmented Reality in the classroom for learning, and she has plenty of great information about her work and ideas at her blog. She even has a free guide to using the Aurasma app, as well as some handy videos. I love it when other teachers share what they are doing. Thanks, Erin! I could see this technology being used in a classroom (with access to mobile devices, by the way) where presentation posters hang on the walls, and students use the app to create layers of information about their projects; or in a library, where book reviews might be embedded as invisible overlays; or perhaps the layers are part of an informational treasure hunt around the room, or school; or … well, who knows? The ease of Augmented Reality is still pretty new, and so, the possibilities are still unknown. What would you do? What will you do? If you make something, share it out in the comment section, so I can check it out. 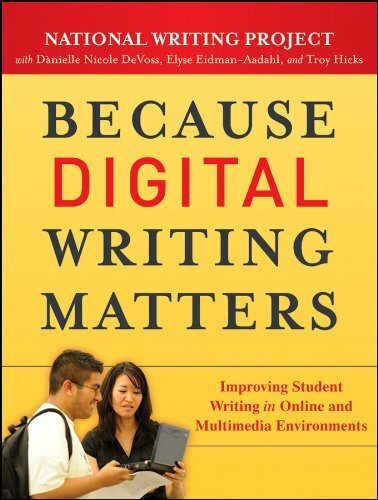 This entry was posted in Apps, Technology Resources. Bookmark the permalink.